This is an article about an experience with an InstaPot -- probably not something you expected to see in The Kuper Report. However, it speaks to a larger issue - the importance of usability testing. Over the holidays there was a great sale on an InstaPot, a combination pressure cooker and slow cooker for those who may not know what it is. I’d always wanted a pressure cooker, because when I was growing up my mom made really delicious food in her pressure cooker, including the best chicken soup on the planet. My mom passed many years ago, and unfortunately I never captured any of her recipes, which I don’t recall ever being written down. Back then, pressure cookers were stove-top devices and extremely dangerous if you didn’t know what you were doing. Today’s electric ones are supposed to be much safer. But I digress. So I bought the InstaPot and, eventually, I got around to reading the instructions on how to use it. I did the “test” run to make sure it worked -- and it did. I then attempted to follow instructions I found online to prepare Trader Joe’s Brown Rice Medley that my wife had purchased and seen someone else prepare in an InstaPot. It didn’t quite come out right, but we managed to salvage it. On another occasion I found instructions to prepare oatmeal, and somehow I managed to get this right. Then, after not using the InstaPot for a few weeks, I went and tried to make the Brown Rice Medley again. This time something went wrong. It was taking way to long and making all kinds of noises and eventually displayed “burn”. I was, of course, not a happy camper. The rice was hard and not cooked. I had no idea what went wrong. We did, however, eventually manage to salvage the rice with lots of water and microwaving a lot. At this point, I had no idea what went wrong. Then, the next day, I attempted to make oatmeal again. I did everything the same (or at least I thought I did) as the last time I made oatmeal. Again, something went wrong. It was taking way too long and eventually displayed “burn”. Once again I was not a happy camper. I thought the InstaPot might be broken. I scoured the internet for clues as to what the problem might be. I eventually figured out what the problem was. 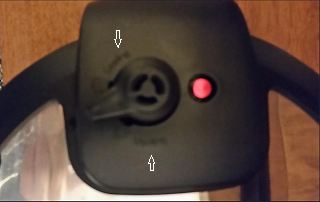 On the lid of the InstaPot is a valve. The valve is supposed to be set to “Steaming” when using it as a pressure cooker. I thought I’d set it properly, but apparently I had not. So, user error, right? Well, yes and no. As you will see by the picture, on which I’ve added a couple of white arrows to help explain, the words “Steaming” and “Venting” are the same color as the background, and therefore extremely difficult to read. It is therefore very easy to assume you are making the right choice when you are not. In my opinion, this is a serious design flaw, and, just maybe, it never went through a proper User Acceptance Test. The point here is that usability testing is important. If I had been the usability tester for this product, I would have failed its valve design. I would have recommended that the lettering should be white on the black background so that it could more easily be read. I would also have recommended additional text. Under "Steaming" I would recommend adding something like: "Turn here for Pressure Cooking". Under "Venting" I would recommend adding something like: "Use extreme caution and pot holder glove when turning valve to release pressure, and stand away from valve" (because you don't want to burn your face or other body part when the hot steam comes rushing out).